The Indian Botanic Garden is not taking any chances with its most precious member — the 300-year-old great banyan tree — this nor’wester season. It has taken special protective measures to keep the tree safe and sound. It is not to be forgotten that way back in 1864 and then again in 1867, two cyclones wreaked havoc on the tree, finally resulting in the amputation of the main trunk in 1925. A total of 67 weak spots have been identified all over the tree and extra protection to these have been arranged for. Over the past one month, the garden has lost six full grown trees that were over 75 years old and this has caused a lot of panic among the scientists and keepers at the garden. 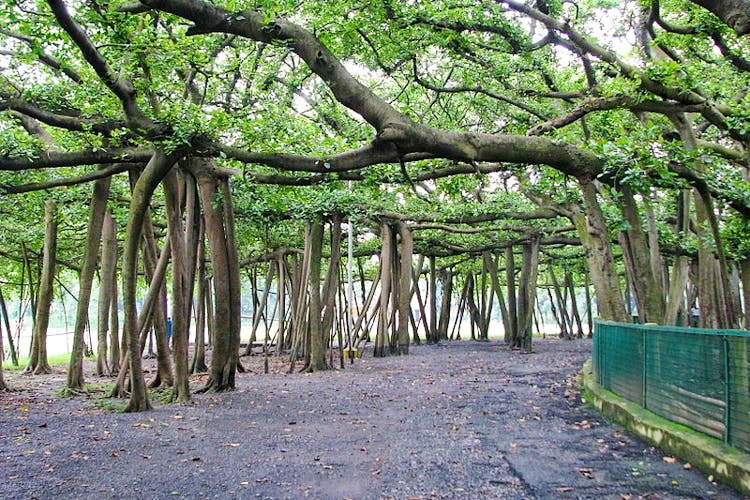 The most vulnerable part of the Banyan are the young stilt roots and branches on the eastern side where the tree is growing now and also the oldest portions. The latter parts are easily breaking off either due to strong wind or due to fungal/termite infestation. Every time an injury happens, the exposed bruise becomes susceptible to fungal infection and need topical curing. “So, we are trying to reduce all possible injuries because fungal infections can be fatal. After the main trunk was repeatedly damaged in the cyclones of 1864 and 1867, fungal infection spread fast and botanists fought for 58 years to save it. Finally, they lost the battle and the main trunk had to be amputated. Luckily, the stilt roots acted as trunks and saved the life of the precious tree,” said Basant Singh, a senior botanist at the Garden. A thorough survey of the giant tree was done and it was found to be weak in 67 parts. Bamboo and eucalyptus poles of heights varying from 15ft to 20ft, were brought in to act as supports here. At some points, horizontal machans have also been created so that the weight of the weak branch can rest on them. All the bruises of the tree have been checked and anti- fungal/anti termite medicine, Blitox mixed with linseed oil, has been applied to pre-empt any attack. “There is a team of eight botanists and five keepers who monitor the tree. A thorough check is conducted immediately after a nor’wester, no matter how late in the night it is. In case of wounds, leaving it unattended for long, might cause irreversible infection, so we don’t waste any time,” said Pratibha Gupta, joint director of the Garden.